The new youth-run environment initiative the Av Green Team is hosting a free sustainability day for everyone to enjoy! The day will kick off with a beach clean of Bilgola Beach at 10.30am followed by a workshop and speaking-based event held at Bilgola Surf Club. The sustainability event from 12-4pm will feature speakers and workshops from individuals and groups who are choosing to work or live sustainably. The aim of the event is to bring people together who would like to learn more about sustainability and becoming environmentally conscious. There will be nibbles and Chai tea prepared by members of the Av Green Team and live music too. Please RSVP to this event through the ticket link above! See the likes of pro-skateboarders and roller skaters from around Australia conduct demos, workshops and show off their skills in the new park. Check out the skate lessons, free skating, best trick comps and awesome demos as well as a BBQ, DJ and prize give aways. Park at Mona Vale Beach car park and get the shuttle bus to Kitchener Park Mona Vale or park at Beeby Park or Bungan Lane car park in Mona Vale. The new skate park will cater for the interest, needs and safety of current and future generations of skate facility users including skateboard, BMX, scooter users and roller skaters and promote youth involvement in recreational and social activities and events. This great photo by a local student was taken at Avalon Beach on Friday afternoon. We all know it's been a but cold and damp this week, lots of snow for those who love skiing or tobogganing , and lots of rain for ducks to go paddling in. Among all the showers there have been bursts of sun, which can make rainbows. A double rainbow, or secondary rainbow, is caused by a double reflection of sunlight inside the raindrops, and are centered on the sun itself. They are about 127° (violet) to 130° (red) wide. Since this is more than 90°, they are seen on the same side of the sky as the primary rainbow, about 10° above it at apparent angles of 50–53°. As a result of the "inside" of the secondary bow being "up" to the observer, the colours appear reversed compared to the primary bow. The secondary rainbow is fainter than the primary because more light escapes from two reflections compared to one and because the rainbow itself is spread over a greater area of the sky. Each rainbow reflects white light inside its coloured bands, but that is "down" for the primary and "up" for the secondary. The dark area of unlit sky lying between the primary and secondary bows is called Alexander's band, after Alexander of Aphrodisias who first described it. Alexander of Aphrodisias was a philosopher and teacher. The term "philosopher" comes from the Ancient Greek word (philosophos) meaning "lover of wisdom". Its origination has been ascribed to the Greek thinker Pythagoras. Alexander lived and taught in Athens at the beginning of the 3rd century, where he held a position as head of the Peripatetic school. The school originally derived its name Peripatos from the peripatoi (Greek "colonnades") of the Lyceum in Athens where the members met. A similar Greek word peripatetikos refers to the act of walking, and as an adjective, "peripatetic" is often used to mean itinerant, wandering, meandering, or walking about. Thanks Bernadette - great snap! Compliance and Enforcement Report Card. The Native Vegetation Report Card provides the latest information on the conservation, restoration, management and approvals for clearing native vegetation across NSW. Over 200,000 hectares of native vegetation were conserved or improved across the State in 2013–14. In contrast, around 900 hectares were approved to be legally cleared where environmental values were maintained or improved through mechanisms such as the use of offsets. The Private Native Forest Report discusses land managed under Private Native Forest (PNF) Property Vegetation Plans (PVPs). Around 41,000 hectares of land were approved during 2013–14 to be managed under PNF PVPs. The NSW Woody Vegetation Change Report 2011–13 covers losses in woody vegetation due to clearing for agriculture, forestry and infrastructure activities. The total reduction in the area of woody vegetation in NSW from these activities over the period 2011–13 was 68,000 hectares or 0.08% of the area of NSW. The report also includes losses in woody vegetation resulting from bushfires. However, the report does not identify gains in woody vegetation due to planting and natural regrowth. OEH and the EPA are responsible for implementing a credible compliance and enforcement framework to protect the environmental values of native vegetation and ensure that landholders who comply with the law are not disadvantaged. OEH and EPA undertake this role through stakeholder engagement, strategic investigations, appropriate enforcement actions and targeted compliance campaigns. The Compliance and Enforcement Report Card provides information on OEH and EPA's compliance and enforcement activities. Report 2013–14 demonstrates that extensive areas of native vegetation are being actively managed and conserved by farmers and rural landholders who understand the value in conserving remnant vegetation. Previous versions of the report are available at the bottom of this webpage. The NSW Report on Native Vegetation 2013-2014, released by the Office of Environment and Heritage today shows 13,500ha of woody vegetation that was cleared for crops, pastures or thinning over the three years to 2013 was “unexplained”, and probably illegal. The figures also showed “unexplained” clearing occurred on more than 4,400 properties, yet government agencies launched and completed only 818 compliance and enforcement actions in the same period. “This report shows that the Baird government is soft on illegal land clearing,” Nature Conservation Council CEO Kate Smolski. “We fear it is just a glimpse of what’s to come if the government introduces its new land-clearing laws with weaker environmental protections to parliament later this year. “These figures show that the Baird government is not giving Local Land Services and other agencies the resources they need to monitor land clearing and to enforce the laws that are supposed to protect our soils, water resources and wildlife habitat. “The area of woodland and wildlife habitat that has been illegally cleared is more than twice the size of Sydney Harbour, and would have provided habitat for thousands of native mammals. Ms Smolski said the report also raised concerns about the ability of environmental agencies to detect and report on losses of bushland in a timely manner. Nearly 100 National Parks and Wildlife Service (NPWS) staff from the Metro North East Region will be participating in training on Wednesday 3 August at Lane Cove National Park in readiness for the upcoming fire season. NPWS Metro North East Regional Manager, Peter Hay said the day is about refreshing NPWS staff skills for operations in fire emergencies for the coming fire season and importantly personal safety measures. "Each year we apply different elements to keep it fresh, one of the most important activities this year is an "entrapment exercise" which is based on a fire overrun situation, which will be a practical session on how to deal with a scenario where a firefighting vehicle is overrun by fire," Mr Hay said. "This session involves doing a number of specific activities within a set timeframe including donning all personal protective equipment, preparing the vehicle by starting the water pump, removing fuel containers from the vehicle, donning a protective blanket, closing vents, radioing for help and getting low down in the vehicle. "It is very important that in the rare event of this happening, our staff are fully prepared." This year's training will take place at Lane Cove National Park, in the centre of the Metro North East Region, which also provides an opportunity for staff not working in the park to familiarise themselves with surrounds and operational aspects of firefighting in the Lane Cove Valley. • information on the seasonal weather outlook for the next fire season, so everyone is aware of trends known to date. The Metro North East Region Fire Preparation Day will be held Wednesday 3 August 2016 at Haynes Flat, Max Allen Drive, Lane Cove National Park. A new wind energy planning framework will ensure that NSW has the right settings to attract investment in wind energy, while balancing the interests of the community. The new framework will address delays in the assessment process that in one case required more than 2500 days for a project to be determined. The average determination times for wind projects in the past five years has been more than 1000 days. Planning Minister Rob Stokes said the new framework is focused on driving better outcomes by encouraging proponents to engage early with the community. The policy framework has been developed in response to issues raised by community and industry around uncertainty in the application of the draft 2011 wind farm guidelines. Mr Stokes is inviting the community to have its say on the new planning framework. “We’ve consulted widely, including with key environmental groups, industry, other states and the Australian National Wind Farms Commissioner, to better understand the key issues in developing this framework,” Mr Stokes said. Overwhelmingly, the most contentious issues in dealing with wind projects are noise and visual impacts. The framework will provide guidance to the industry on how to better design their projects with these impacts in mind, in the context of environmental, social and economic impacts. It will provide greater certainty and consistency for the renewable energy industry and the community. Importantly, there will be no arbitrary buffer zones based on the height of turbines. For all other assessment requirements, wind energy developments will be subject to the same assessment framework as other State Significant Developments. “This new framework puts in place processes to identify potential impacts at an early stage to minimise conflict and delays,” Mr Stokes said. “The framework strikes the appropriate balance between giving clear guidance to industry whilst ensuring that the impacts of the project are assessed on their merit. Submissions for the proposed wind energy framework can be made until 16 September 2016. The proposed new framework can be viewed at the link below or at the Department of Planning and Environment, 23-33 Bridge St, Sydney. • Submissions close on 16 September 2016. With spring just around the corner, it’s a great time of year to get outdoors in a national park and enjoy the crisp sunny days and beautiful blossoming flowers. Muogamarra Nature Reserve, located in the northern outskirts of Sydney, transforms into a brilliant display of colour each August and September, when spring wildflowers come into bloom. The reserve is only open for six weekends a year to preserve the fragile ecosystems and Aboriginal heritage, and this year, will be open each Saturday and Sunday from 13 August to 18 September. The best way to explore the extraordinary nature reserve is on a special guided tour. There are three guided walks on offer, where you’ll see and learn about the reserve’s spectacular plants and enjoy stunning scenery. Or for the more adventurous, join the full-day 18km kayaking tour along the Hawkesbury River to see the reserve from the shoreline, take in the sheer cliffs and learn about the area’s fascinating history. Looking for a walking adventure close to Sydney? The Coast track in Royal National Park, just one hour south of the CBD, is definitely one for your to-do-list. You’ll walk along cliffs, beaches and escarpments, taking in magnificent ocean views and the rugged beauty of the coastline as you go. The 26km track can be walked over two days, combined with an overnight camping experience, or broken up into a series of day walks. There’s also been no better time to lace up the boots and set out, as the track has recently undergone a $1.8 million upgrade over nine months. Works included construction of sandstone stairways and installation of 2.2km of new boardwalk at several sites. This work has enhanced the walking experience for visitors, but has also prevented soil erosion and protected coastal vegetation. The Coast track will also benefit from the recent funding announcement from the NSW Government, with $3.6 million allocated for the next 12 months and $9 million over four years. The solar revolution is already here – even in Australia’s most famous mining town! While tropical forests continued to decline, a remarkable change is happening: tree cover on agricultural land has increased across the globe, capturing nearly 0.75 Gigatonnes carbon dioxide every year. A new study titled "Global Tree Cover and Biomass Carbon on Agricultural Land: The contribution of agroforestry to global and national carbon budgets" provides insights into the patterns of this tremendous change at global, regional and national scales. According to the International Panel on Climate Change (IPCC), agriculture and land-use change account for about 24% of the world's greenhouse gas emissions. Climate change will also have strong impacts on food security in the long-term. Therefore agriculture needs to reduce its climate footprint. But a recent study has shown that the potential to reduce greenhouse gas emissions from crop and livestock production is limited. At the same time, large forest areas, primarily in the tropics, are still being converted into agricultural land to feed the world's growing population. For these reasons, agricultural practices that can significantly reduce carbon emissions are in high demand. Trees on agricultural lands -- also known as agroforestry systems -- have the potential to contribute to climate change mitigation while improving livelihoods and incomes and providing invaluable ecosystem services at the same time. The World Bank estimates that globally 1.2 billion people depend on agroforestry farming systems, especially in developing countries. However, trees on agricultural lands are not considered in the greenhouse gas accounting framework of the IPCC. A team of researchers from various institutions in Africa, Asia and Europe carried out a study to assess the role of trees on agricultural land and the amount of carbon they have sequestered from the atmosphere over the past decade. The study, entitled "Global Tree Cover and Biomass Carbon on Agricultural Land: The contribution of agroforestry to global and national carbon budgets," looks at biomass carbon on agricultural land both globally and by country, and what determines its distribution across different climate zones. "Remote sensing data show that in 2010, 43% of all agricultural land globally had at least 10% tree cover, up from eight percent in the preceding decade," said Robert Zomer of the World Agroforestry Centre, lead author of the study. "Given the vast amount of land under agriculture, agroforestry may already significantly contribute to global carbon budgets." However, regional differences in the trend are significant. The distribution of tree cover on agricultural land depends on climatic conditions in different parts of the world. High tree cover is found in humid areas such as South East Asia, Central America, eastern South America, as well as central and coastal West Africa. Tree cover on agricultural land was moderate in south Asia, sub-humid Africa, central and western Europe, the Amazonia and mid-west North America. On the other hand, low tree cover was found ineast China, northwest India, west Asia, the southern border of the Sahara Desert, the prairies of North America and southwest Australia. Remarkable differences are noted in changing biomass carbon stocks over time among countries. Brazil, Indonesia, China and India had the largest increases, while Argentina, Myanmar, and Sierra Leone had the largest decreases in biomass carbon stored on agricultural land. High average carbon mass levels were to be found in 26 countries in the humid tropics, with the Democratic Republic of Congo, Papua New Guinea, Malaysia and Indonesia in the lead. On the other hand, 60 countries found in arid and desert parts of the world around the Sahara Desert in North Africa, the Kalahari in southern Africa, Middle East, as well as central and southern Asia recorded low carbon levels over the ten-year period. "Study results show that existing tree cover makes a major contribution to carbon pools on agricultural land, demonstrating the potential to add to climate change mitigation and adaptation efforts," said Jianchu Xu of the World Agroforestry Centre. "If tree cover is accounted for, the total carbon stock is over four times higher than when estimated using IPCC tier 1 estimates alone." Given the large amount of agricultural land where tree cover is below its potential, the study suggests that a huge mitigation potential exists and should be explored more systematically. "The results of our spatial analysis show that trees on agricultural land sequestered close to 0.75 Gigatonnes of carbon dioxide globally per year over the past decade," said Henry Neufeldt, Head of Climate Change research at the World Agroforestry Centre. "If we can harness good policies to enhance positive examples and stop negative trends, trees in agricultural landscapes can play a major role in greenhouse gas mitigation. But no one should say that this is already solving the problem for agricultural emissions as long as we do not know what is actually happening on the ground." Today the Land and Environment Court gave a green light for Santos to operate its 'Leewood' coal seam gas (CSG) wastewater treatment facility near Narrabri and the world-renowned Pilliga State Forest in North-West NSW. Community group People for the Plains – represented by public interest environmental lawyers EDO NSW – argued that the Leewood facility is unlawful because it did not go through the proper assessment process before being approved. The facility was approved in August 2015 by the NSW Department of Industry without an Environmental Impact Statement (EIS) being prepared and without the public being given a chance to comment. However, the Land and Environment Court decided that the approval was valid, meaning that the facility can now begin operation. It is expected to treat up to 1.5 million litres of CSG wastewater every day. Do you have a connection to a Harbour Trust site? If so we’d love to hear it. The Sydney Harbour Federation Trust is gathering the stories of those who lived or worked at Harbour Trust managed sites. Were you based at North Head or Georges Heights? Did you work on ships at Cockatoo Island? Did you serve at HMAS Platypus or attend ASOPA? Maybe you were one of the lucky few who lived at one of these sites. A Harbour Trust oral history volunteer would love to interview you and hear your tales of work and life. Whether you were a boiler maker, soldier, shipwright, secretary, student or management, your story is important in preserving the history of these sites for future generations who have never known them as working, active hubs. If you, or someone you know, would like to be interviewed please emailcatherine.enright@harbourtrust.gov.au or call (02) 8969 2112 for more information and to book in an interview. Interviews are approximately 1hr long and are conducted at Georges Heights or Cockatoo Island. We look forward to hearing from you. A brief introduction to how satellite telemetry has been used to investigate the migration and foraging behaviour of Caspian seals, including a visualisation of animated seal telemetry tracks. Dr Simon Goodman from the Faculty of Biological Sciences at the University of Leeds, who led the study, said: “Some of the findings really surprised us – for instance one seal swam 14,400km in a year, and many of the seals we tracked during the summer stayed at sea for around 6 months without coming back to land. As well as giving insights into the ecology of seals, this work provides vital information for conservation efforts. Caspian seals are listed as an endangered species by the International Union for the Conservation of Nature and their population has dropped by 90 per cent in just over 100 years, from more than one million at the start of the 20th century. This was primarily due to intensive hunting, which lasted until the early 1990s, but the main threats now come from drowning in fishing nets set by sturgeon poachers, habitat loss and other disturbance from human activities. "The data from telemetry studies such as this can help identify key areas of seal habitat which might be incorporated into future protected areas, and planning other human activities, such as oil and gas developments so they don’t impact on seals,” said Dr Goodman. The study was led by researchers from the University of Leeds, together with scientists from Estonia, Kazakhstan, Russia and Northern Ireland. Dmitrieva et al. 2016. Individual variation in seasonal movements and foraging strategies of a land-locked, ice-breeding pinniped. Marine Ecology Progress Series 554: 241–256. doi: 10.3354/meps11804. 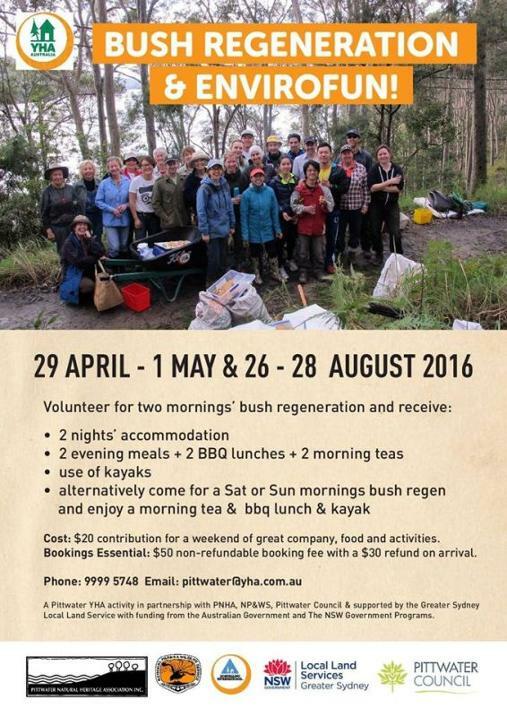 Volunteer for two mornings’ bush regeneration and receive free accommodation, two evening meals, two BBQ lunches and two morning teas and free use of kayaks over the weekend of 26 to 28 August. Alternatively come for a Saturday or Sunday morning bush regeneration and enjoy a morning tea and BBQ lunch and kayak. It is only a $20 contribution ($50 nonrefundable booking fee with a $30 refund on arrival) for a weekend of great company, food and activities. A Pittwater YHA activity in partnership with: • Pittwater Natural Heritage Association • National Parks and Wildlife Service • Northern Beaches Council • supported by the Greater Sydney Local Land Service • with funding from the Australian Government and the NSW Government. The National Parks and Wildlife Service (NPWS) has welcomed the arrival of southern right whales off the NSW coast again this year after one was spotted entering Botany Bay today just off the coast of Sydney. NPWS Wildlife Management Officer Geoff Ross said it's great to see southern right whales in NSW waters again and it is a timely reminder that we share our harbours, bays and oceans with these majestic animals. "Every year we are seeing more southern right and humpback whales pass the NSW coast as their populations recover and they are regularly sheltering in our estuaries, harbours and major waterways, even busy Sydney Harbour," Mr Ross said. "The recent sightings of the southern right is very exciting as it means that the species is slowly returning to their traditional places in NSW bays and inlets. These sheltered bays and inlets were traditional calving areas for right whales and we are seeing them return home after whaling pushed them to the brink of extinction. "With infrastructure, people and large numbers of commercial and recreational vessels making the formerly quiet bays and inlets of the NSW coast now very busy, we need remind people to give these whales space and share the water. Southern rights love the shallow water, are hard to see and they travel slowly making them more vulnerable to vessel strike and entanglement. "For the safety of the whales and the boating community, Masters should ensure their vessels stay 100m from a whale or 300m when a calf is present or the vessel is a jet ski. "If you're swimming, diving or just enjoying the water on your own or with friends and you spot a whale, then you must stay at least 30m from the whale in any direction. "While the humpback whale population is recovering strongly, with an estimated 24,000 individuals in the wild, sightings of the southern right whales close to shore is significant as their numbers are still very low especially in NSW waters where aerial surveys over the past four years have counted only 17 right whales." "We can individually identify right whales by the shape and pattern of their callosities (hard growths on their head) so NPWS is working with university researchers to obtain photographs of the whales using remotely piloted aircraft or UAVs (Unmanned Aerial Vehicles). "These photos will then be added to the Australasian Right Whales Photo Identification Catalogue (ARWPIC) providing wildlife managers with important information," Mr Ross said. • For all vessels, a distance of between 100m and 300m is established as the 'caution zone'. In this zone, vessels must travel at a constant slow speed and leave a negligible wake. It's also important to assess the direction that the whales are travelling in, and then plan the best course of action. • These animals can be unpredictable in their behaviour so NPWS remind other UAV users to maintain aircraft approach distances. If you're flying a UAV or a plane, or helicopter and you spot a whale, then you must be at a height no lower than 300 metres; within a horizontal radius of 300m for aircraft, and for helicopters, gyrocopters and UAVs, the distance increases to 500m. • If you see a stranded, entangled or sick whale in distress, please report it immediately to the NSW National Parks and Wildlife Service or ORRCA. • The southern right whale is a baleen whale and one of three species classified as right whales. This species is easily distinguished from others because of their broad back without a dorsal fin, wide pectoral fins, a long arching mouth that begins above the eye and small rough patches of skin (or callosities) on its large head. Its two separate blow holes produce a distinguishing V-shaped blow. • Land-based whaling in Australia initially concentrated on southern right whales. They get their name because they were the 'right' whale to catch: they were slow-swimming, floated when dead, and provided large amounts of valuable products - particularly oil for illumination and lubrication. • Commercial whaling began in Australia in 1820, taking around 75% of the southern right whale population between 1835 and 1845, when the industry collapsed. It took another 90 years before they were officially protected. • An estimated 12,000 southern right whales are spread throughout the southern hemisphere, compared to an original population before whaling of more than 100,000. However, their numbers are growing at around 7% each year. Most walks start at 7.30 or 8am and last a couple of hours. Bring binoculars and morning tea for afterwards if you like. Contactpnhabirdwatching@gmail.com for details of each walk. Establishment of an underground coal mine and associated infrastructure (see Preliminary Environmental Assessment). The proposal will also require Commonwealth assessment under the EPBC Act. •An operational workforce of 300 full time employees. The Project constitutes State Significant Development. As such, the Project has been subject to the assessment process under Division 4.1 of Part 4 of the Environmental Planning & Assessment Act 1979. Proposed modification to Springvale Mine's consent SSD 5594 to (i) increase run of mine coal production limit from the approved 4.5 Mtpa to 5.5 Mtpa, (ii) increase workforce from the approved 310 full time equivalent personnel to 450 full time equivalent personnel, (iii) increase coal stockpile capacity at the Springvale pit top from the approved 85,000 tonnes to 200,000 tonnes. Amend applicant name on SSD 5594 from 'Centennial Springvale Pty Limited' to 'Springvale Coal Pty Limited'. New research has found methylmercury -- a potent neurotoxin -- in sea ice in the Southern Ocean. Published today in the journal Nature Microbiology, the results are the first to show that sea-ice bacteria can change mercury into methylmercury, a more toxic form that can contaminate the marine environment, including fish and birds. The findings were made by an international team of researchers led by Ms Caitlin Gionfriddo and Dr John Moreau from the University of Melbourne, and also included scientists from the Centre for Systems Genomics at the University of Melbourne, the US Geological Survey and Lawrence Livermore National Lab. Methylmercury builds up in the food web through a process called 'biomagnification', said Ms Gionfriddo, PhD candidate from the School of Earth Sciences, University of Melbourne. "Larger fish eat smaller contaminated fish, and continuously accumulate methylmercury at harmful levels for human consumption," Ms Gionfriddo said. The team wanted to understand more about how the most toxic form of mercury enters the marine environment, and the food we eat. Ms Gionfriddo spent two months aboard the icebreaker Aurora Australis to collect samples of Antarctic sea ice during an expedition mounted by the Australian Antarctic Division. The ice was analysed for different forms of mercury, including methylmercury, at the US Geological Survey in Wisconsin (USA). The DNA and proteins from sea ice microorganisms were studied at the University of Melbourne (AUS) and Lawrence Livermore National Lab (USA). Mercury is a heavy metal pollutant that can be released into the environment through volcanic eruptions and re-released from vegetation during bushfires. It is also created through human activity, such as gold smelting and burning fossil fuels. University of Melbourne geomicrobiologist and team leader, Dr John Moreau, said that the results confirmed the presence of bacteria in the sea ice with the genetic ability to convert mercury into the more toxic form. These findings highlight the importance of eliminating mercury pollution from the environment, and following current recommendations to limit consumption of certain types of fish, say the researchers. "These results are the first to identify a particular genus of bacteria, Nitrospina, as capable of producing methylmercury in Antarctic ice," Dr Moreau said. "The presence of these potential mercury-methylating bacteria raises an interesting question," he added. "Could they also play a role in forming the methylmercury observed in the oceans worldwide?" The team are keen to understand this process in the next steps of their research. "Mercury has a long lifecycle in the atmosphere, up to a year," said co-author Dr Robyn Schofield. "This means that mercury released through fossil fuel burning from countries over 3000 km away goes up in the atmosphere and ends up in Antarctica." "The deposition of mercury into the sea occurs all year-long but increases during the Antarctic spring, when the sunlight returning causes reactions that boost the amount of mercury that falls onto sea ice and the ocean," Ms Gionfriddo added. "We need to understand more about marine mercury pollution," said Dr Moreau, "Particularly in a warming climate and when depleted fish stocks means more seafood companies are looking south." This project was supported through funding from the Australian Government's Antarctic Science Grant Program (AAS4032) and The University of Melbourne Joyce Lambert Antarctic Research Seed Funding Grant (no. 501325). The Australian Government has honoured its commitment to investigate the potential risks to human health from the long term use of legacy fire fighting foams. Minister for Health Sussan Ley confirmed today, as a first step, the appointment of an independent consultant to review the interim toxicity reference values for the chemicals per- and poly-fluorinated alkyl substances (PFAS) in drinking water. “The current interim guidelines on PFAS were developed by the cross-jurisdictional Standing Committee on Environmental Health, or enHealth,” Ms Ley said. “In June 2016, enHealth reviewed overseas approaches for setting guideline values for PFAS in drinking water, and provided additional guidance, including recommendations for Australian guideline values based on the European Food Safety Authority approach. “The Government has appointed Adjunct Professor Andrew Bartholomaeus to conduct an independent evaluation that will consider approaches and assumptions used and relevance of these approaches to the Australian context, having regard to current Australian regulatory science policy. Minister Ley said Adjunct Professor Bartholomaeus is an expert in toxicology and chemicals regulation. ”He has advised World Health Organization expert bodies that provide human safety assessments of chemicals and recommend toxicity values. “He has also held senior toxicology roles with the Australian Government in Food Standards Australia and New Zealand, the Therapeutic Goods Administration and the Office of Chemical Safety. “His experience in best practice health risk assessment makes him the ideal person to undertake this important review,” Ms Ley said. The Commonwealth Government has commissioned an independent review of the interim guidance values established by the Environmental Health Standing Committee (enHealth) for perfluorinated compounds in drinking water and recreational water. EnHealth released the interim guidance values in June 2016 after consultation with relevant health experts. The interim guidance values agreed by enHealth are based on the European Food Safety Authority (EFSA) guidance values, and are intended for use in site investigations in Australia pending development of final guidance values by Food Standards Australia New Zealand later this year. 1. Approaches and assumptions used by EFSA, as outlined in the reports Perfluorooctane sulfonate (PFOS), perfluorooctanoic acid (PFOA) and their salts, Scientific Opinion of the Panel on Contaminants in the Food Chain (2008) and Perfluoroalkylated substances in food: occurrence and dietary exposure (2012). 2. Approaches and assumptions used by the United States Environmental Protection Agency (US EPA), as outlined in the 2016 Health Effects Support Document for Perfluorooctane Sulfonate (PFOS) and the 2016 Health Effects Support Document for Perfluorooctanoic Acid (PFOA). v.	the National Health and Medical Research (NHMRC) Guidelines for Managing Risks in Recreational Water (2008) and NHMRCAustralian Drinking Water Guidelines (2016). A report will be provided to the Minister for Health, the Hon Sussan Ley MP, for consideration and appropriate action through the Council of Australian Governments (COAG) Health Council, and for subsequent consideration by relevant state and territory agencies. The Minister for Health will ensure the implications of the report’s key findings are communicated to affected communities and that key findings inform future activities within the Australian context. A new fund to accelerate the development and commercialisation of Australian biomedical discoveries is now officially launched. Minister for Health and Aged Care Sussan Ley and Minister for Industry, Innovation and Science Greg Hunt today announced the $500 million Biomedical Translation Fund (BTF) was open for applications from private life sciences fund managers seeking to participate. Ms Ley said the Government’s $250 million investment in the BTF would be dollar-matched by private sector co-investment. “This investment will ensure the most promising discoveries from world renowned, innovative Australian health and medical research will gain access to institutional growth capital to be turned into better drugs, better devices and better health outcomes for Australians,” Ms Ley said. “Without increased access to venture capital and entrepreneurial investment we risk missing an opportunity to commercialise our great ideas and research outcomes to benefit all Australians and our economy,” Mr Hunt said. “Today’s announcement delivers on a major element of the National Innovation and Science Agenda to put Australia on the path to a more innovative and entrepreneurial economy. “The BTF will leverage our world leading health and medical research strengths and ensure our best ideas are retained in Australia. Innovation Australia will administer the BTF via its newly appointed BTF Committee chaired by Mr Peter Wills AC. This committee, experienced in health and medical research and venture capital, has been established to oversee the BTF. “The selection of private sector fund managers, backed by astute professional investors, will be competitive to ensure that they have the skills and expertise to make investment decisions that will pave the way for long term health and business wins,” Mr Hunt said. Applications for fund managers are open until 14 September 2016. Further information is available at the Biomedical Translation Fund website. The Australian Electoral Commission (AEC) has announced that the count for the election of twelve Senators for New South Wales was completed today. The Australian Electoral Officer for New South Wales, Doug Orr said the distribution of preferences was conducted today to elect the twelve Senators. "As with all aspects of the count, the automated distribution of preferences undertaken today was open to scrutineers appointed by the candidates," Doug Orr said. All 2016 federal election results are available on the AEC's tally room at www.aec.gov.au/results. Today Prime Minister Malcolm Turnbull and Justice Minister Michael Keenan opened a new purpose-built forensic facility for the Australian Federal Police, which will be one of the most advanced of its kind in the world. The $106m forensic facility, located at the AFP’s Majura Complex in the ACT, will be a global centre of scientific excellence which will position the AFP to respond effectively to Australia’s evolving threat environment, including organised crime and terrorism. More than 200 experts in digital forensics, weapons intelligence, fingerprint and facial identification, and biological and chemical criminalistics will be brought together to enhance the investigative and forensic capabilities of federal law enforcement officers. They will work in a cutting-edge environment that will support collaboration and intelligence sharing with the AFP’s domestic and international law enforcement partners. World-class technology, including an innovative Search Precinct which provides a central hub for the examination of evidence, will ensure the AFP maintains its world-leading capacity in forensic operations, forensic science policy, research, training and capability development. This facility will expand the AFP’s capacity to conduct major investigations and respond to crisis situations, including those involving disaster victim identification. It will enhance the important role the AFP already plays in domestic and international investigations, including its leading role in the ongoing international criminal investigation into the downing of Malaysian Airlines flight MH17. Providing our law enforcement and intelligence agencies with the tools and resources they need is a priority for the Coalition Government. It is vital that our law enforcement agencies have the necessary facilities and resources to enable them to be effective. The Government will continue to support the AFP on its progressive approach to meeting the current and future demands of a complex and increasingly global law enforcement environment. This facility represents the future of the AFP. Today I announce the appointment of Mr Craig Ferguson as Australia's first Consul-General in Phuket, Thailand, with jurisdiction throughout the provinces of Phuket, Krabi and Phang-Nga. Australia’s Consulate-General in Phuket was opened in June 2016 as part of the largest expansion of our diplomatic network in 40 years. 900,000 Australians visit Thailand each year, with approximately a third of those travelling to Phuket. The Government is committed to improving access to consular and passport services in areas popular with Australian travellers. Australia and Thailand have a strong relationship based on shared strategic and economic interests. We work closely together in regional and international forums, including the East Asia Summit, APEC and the United Nations, and on a range of important issues including defence, law enforcement, counter-terrorism, and combatting people smuggling and human trafficking. Thailand is our eighth largest trading partner with two-way trade worth $20.7 billion in 2015. Mr Ferguson is a career officer with the Department of Foreign Affairs and Trade and most recently was Assistant Director, Staffing Operations Section. He has previously served overseas in Shanghai, Brasilia and New Delhi. Mr Ferguson holds a Bachelor of Business from Queensland University of Technology. I would like to thank Australia’s outgoing Honorary Consul in Phuket, Ms Michelle Hawryluk, for her excellent contribution to providing consular services for Australians in Phuket. Parents are vital in encouraging their children to obey the road rules and young drivers are keen to show their parents they can be trusted, which means they may hold greater power in enforcing driver restrictions compared with traditional policing, according to QUT research. Dr Alexia Lennon, from QUT's Centre for Accident Research & Road Safety -- Queensland (CARRS-Q), will present her findings at the 2016 International Conference on Traffic and Transport Psychology being held in Brisbane from August 2-5. CARRS-Q and Griffith University are co-hosting the event which draws together international experts from across the globe to share the latest in road safety research with the aim of reducing road trauma. Dr Lennon said a small but in-depth study of parents and young drivers in Queensland had shown novice drivers were more likely to comply with the Graduated Driver Licensing system when encouraged to do so by parents rather than police. "But the important question is do parents know all the restrictions of the GDL system and if not, how do they guide their children to be safe on the road?" she said. "What we found was that broadly speaking the knowledge of restrictions was strong with all parents aware of zero alcohol limits and mobile phone use, however when it came to other rules, parents were less clear. Many implemented their own rules. "For example, one parent said they restricted their teenager to having only one passenger in the car after 10pm." Dr Lennon said rather than resenting or resisting the responsibility for providing practical and emotional support to their young drivers, parents thought it was part of their parental responsibility to encourage compliance with driving restrictions. "Young drivers on the other hand spoke of being very sensitive to their parents' views and potential disappointment should they find out that they had broken a road rule, taken an unnecessary risk or driven in an unsafe or illegal manner," she said. "This shows that both parents and young drivers perceive the parental guidance and encouragement of compliance as critical to young driver behaviour." Dr Lennon said young newly-licensed drivers were at a higher risk of being involved in a crash than any other age group and two-and-a-half times more likely to be killed in a crash. "The GDL system is designed to address this by limiting novice drivers' exposure to high-risk situations, while allowing them to gain on-road experience," she said. Dr Lennon said parental support was an important part of how young novice drivers navigated Queensland's Graduated Driver Licensing program, however more information was needed about parental views and experience and how much they could effectively guide provisional drivers. She said the next stage of the research project was to use an online survey to more widely identify and assess the effectiveness of what parents were doing to encourage their P-platers to comply with provisional licensing conditions. "Understanding what parents experience as easy or difficult to enforce and the success they achieve with their approach to encourage safe, lawful driving is necessary to help them better protect their teenage drivers." The NSW Government is giving $2 million to support former police officers and their families. The BACKUP for Life program links injured officers and their families with tailored support programs that address the after-effects of trauma. NSW Minister for Police Troy Grant said many former officers carry physical and mental scars for many years after their policing career is over. "Having spent most of my career as a serving officer, I know all too well that police are often expected to be the pillars of strength in situations when those around them are in their darkest hours. We cannot underestimate how significant a burden this is and how adversely an officer's wellbeing can be affected." BACKUP for Life also supports former police officers adjust to a civilian lifestyle and find new jobs. The NSW Government has added 32 new qualifications to the 2017 skills list. Are you looking for a new job? The NSW Government has added more study options to the 2017 NSW Skills List, which defines which courses are eligible for Smart and Skilled funding. NSW Minister for Skills John Barilaro said the skills list connects young people with jobs that meet industry demands. “We consulted with industry and employers to identify the skills they need and we’re confident the qualifications on the new skills list are the ones that the government should be funding,” Mr Barilaro said. There are 730 vocational education and training courses already subsidised by the NSW Government, and the skills list is regularly updated to make sure students can do courses that will help them find jobs. More than half of these result in qualifications of Certificate IV and above. The NSW 2017 Skills List takes into account government priorities such as building infrastructure and rolling out the National Disability Insurance Scheme (NDIS). Prospective students are also encouraged to look at new qualifications in science, technology, engineering and maths (STEM) subjects. Three qualifications will be removed from the skills list due to a lack of enrolments. Researchers at Western Sydney University are looking for participants for a study exploring the long-term experiences of losing a parent during childhood. There is a growing body of knowledge regarding childhood loss and grief, but little is known about adults who have lived with childhood parental death and their subsequent parenting experiences. To better understand this sensitive issue, researchers from the School of Nursing and Midwifery are inviting parents who have experienced childhood parental death to share their experiences. Lead Researcher Dr Gill Murphy says the study will give a voice to those who may have lived with long standing grief. "This study will generate significant new information about helpful responses for children who experience the unfortunate death of a parent," says Dr. Murphy. "This new knowledge will highlight potential interventions to support children and adults in their journeys of loss and recovery." "It will also be relevant for health and social care professionals who are working with families who lost a parent." The research team is calling for participants who are happy to meet with Dr. Murphy, to take part in the study. In particular, the researchers are looking for English speaking adults who lost a parent as a child and who are now a parent themselves. The Sirius apartment building in The Rocks will not be listed on the State Heritage register, NSW Environment and Heritage Minister Mark Speakman said today. Listing the building would reduce the site’s sale value by many tens of millions of dollars (possibly in the order of $70 million), which would otherwise be used to fund many extra social housing units for the neediest in our community (approximately 240 extra if the additional sale proceeds were $70 million). “I am not listing it because whatever its heritage value, even at its highest that value is greatly outweighed by what would be a huge loss of extra funds from the sale of the site, funds the government intends to use to build social housing for families in great need,” Mr Speakman said. The future development of the site would be subject to strict controls and Mr Speakman said he would strongly argue for any future building’s floor space to be restricted to what is currently allowed. 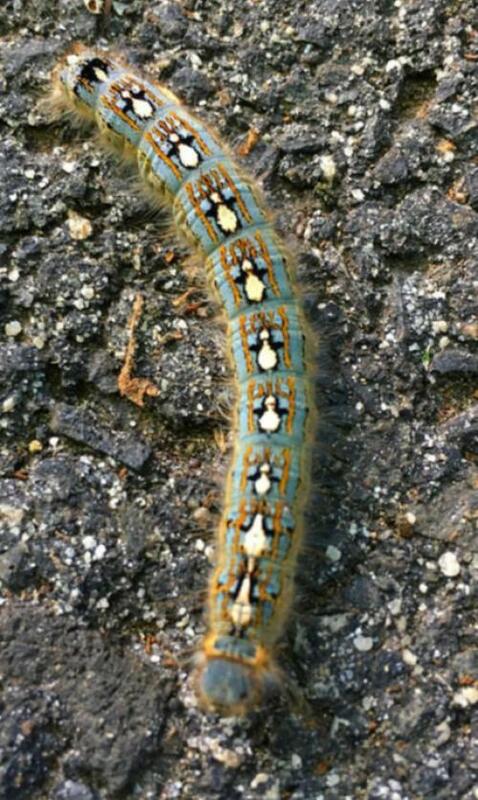 Forest Tent Caterpillar has Penguins on Its Back! If you look at the caterpillar of the forest tent caterpillar moth (Malacosoma disstria) with a little imagination you can see something remarkable - it appears to have markings alike penguins on its back! This caterpillar (and moth) is found in North America. Tent caterpillars do not make tents, but rather, weave a silky sheet where they lie together during molting. They lay down strands of silk as they move over branches and then travel along them like tightrope walkers. The caterpillars are social, traveling together to feed. The caterpillars live in deciduous trees, which they strip off leaves after emerging from their eggs. The adult moth of this species favors oak, sweetgum, tupelo, aspen, and sugar maple. The mum moth lays up to 300 eggs which are stuck to twigs and covered with a gluey cement called spumaline, which prevents them from desiccating and freezing. The eggs hatch the following winter. An early "dashcam" style archive footage film, showing a trip along Wilshire Blvd, Beverly Hills, California in the mid 1930's. The rear facing camera captures many classic & vintage cars from the 1920s and 1930s including a Rolls Royce, a tow truck with a vehicle clearly damaged from an accident, and of course many Ford and General Motors vehicles that were so common during this period. Oscar-nominated film director Bruce Beresford (Breaker Morant ,1980; Driving Miss Daisy, 1989; Mao’s Last Dancer, 2009) was 16 when he shot this 8mm home movie footage in Melbourne. This excerpt features shots of Melbourne streets, Olympic banners, crowds, the Olympic Village and athletes as well as the soccer final between Yugoslavia and the Soviet Union. Future adventurer Mike Leyland entered a cartoon competition at age 15 and received a letter from country singer Smoky Dawson telling him he’d won a trip to the Games of the XVI Olympiad. His father bought him a 16mm movie camera and Mike recorded his experiences, even making his own opening and end credits. As can be seen in the clip below, Mike was lucky to have a seat close to the track for the opening ceremony. He filmed athletes from France, Great Britain and Northern Ireland, India and Australia as they passed by, the lighting of the Olympic Cauldron and a number of events including the walk, hurdles, hammer throw, running and boxing. Two decades later, Mike and his brother Mal Leyland became household names thanks to their travel adventure series Ask the Leyland Brothers (1976-80, 1983-84) which paved the way for future TV personalities like Steve Irwin and programs like Getaway (1992-current) and The Great Outdoors (1993-2009, 2012). Australia’s longest serving prime minister was also a keen amateur filmmaker. Having shot 16mm footage of the London Blitz, the Churchill family at home and members of the British Royal Family, it was no surprise that Menzies took his camera to the Olympics. This footage includes the flags of competing nations around the perimeter of the main stadium; various track events, including the women’s and men’s relays and 800 metres races; and Betty Cuthbert winning a 200 metres heat. Cuthbert, then 18 years old, won three sprinting gold medals in the 100 metres, 200 metres and 4 × 100 metres relay at these Olympics and became known as Australia’s 'Golden Girl’. Real-time water quality data is now available through an online portal. Residents in Sydney, the Blue Mountains and Illawarra can now check their water quality via an online portal that uses real-time data. NSW Minister for Primary Industries Land and Water Niall Blair said drinking water is monitored at key steps from catchment to tap. NSW Health oversees water delivery by Sydney Water and WaterNSW to make sure it meets Australian drinking water guidelines, with scientists running up to 70 different types of laboratory tests every day. A side, false-color view of a solid gallium core coexisting within a liquid gallium nanoparticle. These novel nanoparticles show unique interactions with light and electrons at the atomic scale, which could be exploited by a field called plasmonics for new light-based technologies. Imagine pouring a glass of ice water and having the ice cubes remain unchanged hours later, even under a broiler's heat or in the very back corner of the freezer. That's fundamentally the surprising discovery recently made by an international group of researchers led by an electrical engineering professor at Duke University in a paper published online in Nature Matter on July 25, 2016. But instead of a refreshing mixture of H2O in a pint glass, the researchers were working with the chemical element gallium on a nanoscopic scale. Gallium is a soft, silvery bluish metal at room temperature. Raise the heat to 86 degrees Fahrenheit, however, and it melts. Drop the temperature to subzero levels, and it becomes hard and brittle. But when gallium nanoparticles sit on top of a sapphire surface, they form a solid core surrounded by a liquid outer layer. The discovery marks the first time that this stable phase coexistence phenomenon at the nanoscale has ever been directly observed. "This odd combination of a liquid and solid state existing together has been predicted theoretically and observed indirectly in other materials in narrow bands of specific temperatures," said April Brown, the John Cocke Professor of Electrical and Computer Engineering at Duke. "But this finding was very unexpected, especially because of its stability over such a large temperature range." The temperature range Brown is referring to covers more than 1,000 degrees Fahrenheit, all the way from -135 to 980 degrees. "At a fundamental level, this finding reveals the need to reconsider all our presumptions about solid-liquid equilibrium," wrote Andrés Aguado, professor of theoretical, atomic and optical physics at the University of Valladolid in Spain, in a News and Views piece appearing in the same edition of Nature Matter. "At a more applied level, the results hold much promise for future nanotechnology applications." Gallium is an important element in electronics and is used in microwave circuits, high-speed switching circuits and infrared circuits. The discovery of this novel part-solid, part-liquid nanoparticle phase could be useful in ultraviolet sensors, molecular sensing devices and enhanced photodetectors. Brown hopes this work is just the tip of the iceberg, as she is planning on creating a facility at Duke to investigate what other nanoparticles might have similar unexpected phase qualities. The research was conducted in conjunction with researchers at the Institute of Nanotechnology-CNR-Italy, the University of Western Australia, the University of Melbourne and Johannes Kepler University Linz. Astronomers have managed to peer into the past of a nearby star millions of years before its famous explosion, using a telescope in remote outback Australia at a site free from FM radio interference. Research by an international team including astronomers at the International Centre of Radio Astronomy Research (ICRAR) observing the region at the lowest-ever radio frequencies has helped fine-tune our understanding of stellar explosions. The research paints a picture of the star's life long before its death in what was the closest and brightest supernova seen from Earth, now known as supernova remnant 1987A, which collapsed spectacularly almost 30 years ago. Much had been known about the immediate past of this star through studying the cosmic ruins resulting from the star's collapse in 1987, which occurred in neighbouring galaxy, the Large Magellanic Cloud. However it was the detection of the very faintest of hisses through low-frequency radio astronomy that has provided the latest insights. Previously, only the final fraction of the dead star's multi-million-year-long life, about 0.1% or 20,000 years, had been observable. This latest research -- which has enabled astrophysicists to probe the supernova's past life millions of years further back than was previously possible -- was led by Joseph Callingham, a PhD candidate with the University of Sydney and the ARC Centre of Excellence for All-Sky Astrophysics (CAASTRO). The findings are published today in the Monthly Notices of the Royal Astronomical Society, Oxford University Press. Operating the Murchison Widefield Array in the West Australian desert, the radio astronomers were able to 'see' right back to when the star was in its long-lasting red supergiant phase. Mr Callingham explained previous studies focused on material that was ejected into space when the star was in its final blue supergiant phase. "Just like excavating and studying ancient ruins that teach us about the life of a past civilisation, my colleagues and I have used low-frequency radio observations as a window into the star's life," Mr Callingham said. The star's secret past and deadly explosion are depicted in a video compiled by CAASTRO. The team of researchers found the red supergiant lost its matter at a slower rate and generated slower winds that pushed into its surrounding environment than was previously assumed. "Our new data improves our knowledge of the composition of space in the region of supernova 1987A; we can now go back to our simulations and tweak them, to better reconstruct the physics of supernovae," Mr Callingham said. Professor Lister Staveley-Smith, co-author of this study and Deputy Director of CAASTRO and ICRAR, explained that the Murchison Radio-astronomy Observatory is one of the most radio quiet places on the planet and has enabled these sensitive observations to be made. "Low-frequency radio waves are very sensitive to the presence of intervening plasma, so tell us a great deal about the density of matter immediately in front of the supernova remnant. Their presence also tells us about the in-situ acceleration of very high-energy particles called cosmic rays, many of which are believed to be created in young remnants such as this." Professor Staveley-Smith said. ​NSW Health is warning people to not consume rockmelon that is being recalled while an investigation into the source of a national outbreak of a rare strain of Salmonella is underway. There have been 86 reported cases of Salmonella Hvittingfoss (S. Hvittingfoss) nationally, 43 of these reported in NSW between June 14 and August 1, 2016. The affected people are of varied ages, but 49 per cent (21) of the cases in NSW were in children under five years old. By comparison, between 2011 and 2016, NSW received an average of fewer than two notifications of S. Hvittingfoss per month. The NSW Food Authority advises that the Northern Territory based company “Red Dirt” will undertake a trade level recall of their product after detection of Salmonella bacteria by South Australian authorities on Tuesday 2 August. Food Standards Australia New Zealand (FSANZ) has issued a warning that consumers, especially infants, the elderly, pregnant women or people with compromised immune systems, should not consume rockmelon while the investigation continues. Dr Jeremy McAnulty, Director of Health Protection NSW, said NSW Health was working closely with the NSW Food Authority and other jurisdictions on an investigation into possible food sources. “Although the source of the outbreak at this stage is still unclear, consumption of rockmelon is common to many of the patients in NSW,” Dr McAnulty said. “As a precaution, anyone who may have rockmelon in their home and is unsure of its origin should not eat the product. “Salmonella infection is mainly caused by eating contaminated food. Infection causes gastroenteritis and in some people, particularly young babies, the elderly and those with weakened immune systems, it can be severe and require hospitalisation for dehydration. “Like many other fresh foods, sliced melons can be easily contaminated with Salmonella bacteria and should be kept refrigerated. In Australia, most Salmonella infections occur after eating contaminated food or sometimes after contact with another person with the infection. Safe food handling including thorough cooking of meat, poultry and eggs and good hand hygiene can prevent infection. Regulatory changes in NSW will allow doctors to apply for prescriptions of a broader range of cannabis-based medicines. The changes to the regulations surrounding cannabis-based medicines come as the NSW government invests $21 million to further evidence-based research into their safe and effective use. NSW Premier Mike Baird has endorsed the move, as the new medicines can now be considered by doctors for patients who have exhausted standard treatment options. "People who are seriously ill should be able to access these medicines if they are the most appropriate next step in their treatment," Mr Baird said. Applications from prescribing doctors will be assessed by the Commonwealth Therapeutic Goods Administration and by a committee of medical experts on behalf of NSW Health. Minister for Medical Research Pru Goward stressed the importance of evidence-based research into the safe and effective use of cannabis-based medicines, saying that NSW was regulating these medicines in the same way as any other emerging medicine. For further information about the NSW Government’s medicinal cannabis initiatives visit NSW Health or call 1800 217 257. The state’s Chief Health Officer, Dr Kerry Chant, today handed down the interim report into the medical gas error at Bankstown-Lidcombe Hospital which led to the death of a newborn boy and caused serious harm to a newborn girl. “I deeply regret the profound suffering caused to two families through such a devastating error. I have personally apologised to each family and promised our full support, as well as compensation,” Health Minister Jillian Skinner said. “It is my strong belief that BOC Limited, which installed and certified the medical gas outlet, and Bankstown-Lidcombe Hospital, which was required under Australian standards to check it, will share responsibility for this tragedy. “To date, a hospital engineer involved in the commissioning of the gas outlets in the Bankstown-Lidcombe Hospital operating theatres has been stood down. “A number of investigations are underway, including the investigation being led by Professor Michael Nicholl and the coronial investigation into the death of the baby boy on July 13. These investigations will help identify whether other hospital managers or staff contributed to this tragedy - and, if so, they will be held to account. Every medical gas outlet installed in a NSW Health facility in the last five years is being checked to ensure the correct gas is being emitted. This state-wide audit of gas emissions has been extended to every medical gas outlet in NSW, irrespective of when it was installed. Any future upgrade to medical gas outlets in a NSW public hospital will be required to undergo independent verification. Professor Nicholl, the clinical director of the Women, Children and Family Health at Northern Sydney Local Health District, is leading an investigation team with expertise in a range of medical and engineering specialties. He is due to report by August 25. New research from North Carolina State University connects several pesticides commonly used by farmers with both allergic and non-allergic wheeze, which can be a sensitive marker for early airway problems. NC State epidemiologist Jane Hoppin and colleagues from the National Institute of Environmental Health Sciences (NIEHS), the National Cancer Institute, Westat and the National Institute for Occupational Safety and Health (NIOSH) used interview data from the 2005 -- 2010 Agricultural Health Study (AHS) to evaluate the association between allergic and non-allergic wheeze and 78 pesticides. The AHS is a longitudinal study of farmers and their spouses in Iowa and North Carolina. For the purposes of this analysis, the researchers only used data from the male farmers. In the current study, 22,134 farmers reported which pesticides they had used in the last year, and specific respiratory symptoms they had experienced. Allergic wheeze was defined as reporting both wheezing and doctor-diagnosed hay fever, while non-allergic wheeze was defined as reporting wheezing but no hay fever. The researchers used this information in statistical models to compare the control group -- farmers who had never used the pesticide in question -- to those who had used it, and to compare the frequency of either allergic or non-allergic wheeze. The 78 pesticides included 45 herbicides and plant growth regulators, 25 insecticides, six fungicides, one fumigant and one rodenticide. Of the 78 assessed, 29 were associated with at least one type of wheeze: 19 were significantly associated with allergic wheeze, 21 with non-allergic wheeze and 11 were significantly associated with both. In the herbicide group, 18 were associated with at least one wheeze outcome, 14 with non-allergic wheeze and 10 with allergic wheeze. Glyphosate, the most commonly used herbicide in the world, was associated with both types of wheeze. Interestingly, the less commonly used herbicide glufosinate ammonium was not associated with either type of wheeze. In the insecticide group, nine of the 25 were associated with at least one type of wheeze. Permethrin and pyrethrins were associated with both types of wheeze. And in the fungicide, fumigant and rodenticide group, none were associated with non-allergic wheeze, and only the rodenticide warfarin was associated with allergic wheeze. "This is the most comprehensive list of pesticides in relation to wheeze that has been evaluated to date," Hoppin says. "Fifty-one of the pesticides we tested in this study had never been analyzed in terms of their effects on respiratory outcomes. And some of them, like glyphosate, 2,4-D and permethrin, aren't just used on farms. They're used residentially now to kill weeds or treat fleas on pets. We believe it's important information that will help people make decisions about pesticides." Giving heart attack patients a high dose of omega-3 fatty acids from fish oil, daily for six months after a heart attack improved the function of the heart and reduced scarring in the undamaged muscle, according to new research in the American Heart Association's journal Circulation. The heart's shape and function can be altered after a heart attack, a condition known as post-heart attack remodeling and it is linked with poor patient outcomes and could lead to heart failure. Therapies that can improve healing of the heart or prevent adverse remodeling, remain scarce. A previous study found that omega-3 fatty acids from fish oil were associated with improved survival for heart attack patients, but the role of omega-3 fatty acids in improving the structure and tissue of the heart in patients receiving current guideline-based therapy after a heart attack was unknown. experienced a 5.8 percent reduction in left ventricular end-systolic volume index: a clinical marker that can predict patient outcome after a heart attack; and had a 5.6 percent reduction in a measurement of scarred connective tissue (fibrosis) formation in the non-damaged heart muscle. "Heart failure is still a major problem after a heart attack despite all the therapy we have and the advances in interventional care," said Raymond Y. Kwong, M.D., M.P.H., senior author of the study and director of Cardiac Magnetic Resonance Imaging, Brigham and Women's Hospital and an associate professor of medicine at Harvard Medical School in Boston, Massachusetts. "Our findings show that omega-3 fatty acids are a safe and effective treatment in improving cardiac remodeling, so it may be promising in reducing the incidence of heart failure or death, which are still major healthcare burdens to patients who suffer a heart attack." Researchers said these results suggests that omega-3 fatty acids allow the heart to contract better, and also reduces the fibrosis in the region that is not damaged. The researchers also observed a reduction in biomarkers for inflammation, suggesting that omega-3 fatty acids have some anti-inflammatory properties. The study involved 360 heart attack survivors, half were given a high dose omega-3 fatty acids and half placebo, beginning within a month of the heart attack. Because the study participants were given high doses of omega-3s in addition to their other medications, patients were under a physician's care and observed for any potential adverse outcomes by study authors throughout the study. The treatment was found to be safe and effective. Both groups received treatment based on guidelines issued by the American College of Cardiology Foundation and the American Heart Association. Blood tests were used to confirm that patients in the omega-3 fatty acids group were taking the treatment. L to R: John O’Sullivan, Terence Percival and Graham Daniels, at media event to announce prototypes inclusion in 100 Objects Exhibition. Photo by Jason McCarthy. A revolutionary 1992 CSIRO invention that led to Wi-Fi has been chosen by the National Museum of Australia to be part of the A History of the World in 100 Objects exhibition, opening in Canberra in September. In its only east coast venue, A History of the World in 100 Objects will showcase items from around the globe to explore the last two million years of human history, sourcing the oldest objects from the British Museum’s collection and incorporating those from the present day. The National Museum has chosen to include a 101st object representing a globally recognised Australian innovation. The ground breaking CSIRO wireless local area network (WLAN) Test Bed (the precursor to modern Wi-Fi) is the Australian object featuring in the Canberra exhibition. In 1992, researchers from CSIRO’s then Radiophysics Division developed a technological breakthrough in advanced WLAN. Their WLAN invention increased indoor wireless data transmission rates from 10 megabits per second (10 Mbits/s) to greater than 50 megabits per second (50 Mbits/s) and prevented the distortion of the signal, as the radio waves bounced off walls and furniture. National Museum senior curator Dr Michael Pickering said the WLAN invention is a fitting 101st object in the exhibition because it revolutionised the way people all over the world communicate. “The CSIRO’s practical solution for high speed data transmission was a commercial success and laid the foundation for Wi-Fi, which in turn led to today’s laptop and liberated users from the desktop computer,” said Dr Pickering. “The scientific discovery of Wi-Fi is a perfect example of how research undertaken right here in Australia, by CSIRO, is having a significant positive impact across the globe,” said Mr Brendan Dalton, Chief Information Officer, CSIRO. “It is particularly fitting that Wi-Fi be selected for recognition in this exhibition, as this year marks 100 years since the first Australian national scientific body was formed, a precursor to CSIRO. It’s an opportunity for Australia to celebrate a century of significant scientific breakthroughs, which of course includes Wi-Fi,” said Mr Dalton. The WLAN team consisted of John O’Sullivan, Graham Daniels, Terence Percival, Diethelm Ostry and John Deane. In 2011, CSIRO donated the four main hardware components used in the original WLAN prototype test-bed, to the National Museum. The presentation of this exhibition is a collaboration between the British Museum, the Western Australian Museum and the National Museum of Australia.